Drivers are set for some relief after nearly a month of traffic congestion from road works. Works to install a roundabout at the junction of David’s Lane and Staniland Way in Werrington are easing after lengthy traffic disruption. Both roads are re-opening to traffic tomorrow with the works set to finish on schedule in the first full week of May. The works began on January 5 and included a three-week period where Staniland Way was completely shut off, although that has spread into a fourth week due to a delay.The works, costing £513,000, are needed as the junction is an accident black spot. A Peterborough City Council spokesman said: “Works to install the roundabout at the junction of David’s Lane and Staniland Way in Werrington are continuing with the project due to be completed on time next month. “David’s Lane had due to be closed for the entirety of the project but we will now be re-opening this earlier than planned on the afternoon of Friday, April 17. “Staniland Way will also be re-opened to traffic at the same time. The works on this stretch of road have taken about a week longer to complete than proposed and we apologise for any inconvenience this has caused. Roadworks are still continuing on Bourges Boulevard. The road between the Queensgate and Mayor’s Walk roundabouts will be completely shut southbound between 9pm-6am until Saturday morning. 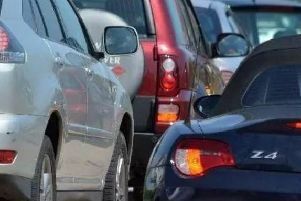 One lane will also be shut in both directions between Queensgate and the Bishop’s Road roundabout on Bourges Boulevard from 9pm-5am, until the early on Friday, April 24.